Introducing El Vez Jones, our Shrinemaster. 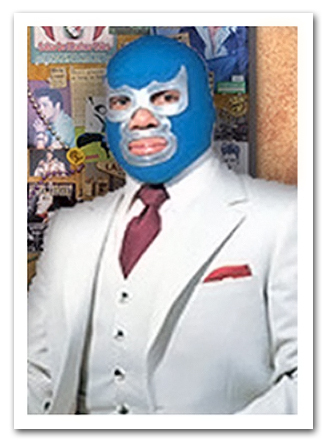 This very mysterious Luchador arrived here from parts unknown in a vintage white Cadillac and a matching suit. We’re pretty sure he comes from somewhere in South America, given his penchant for wearing colorful and finely crafted Mexican wrestling masks (el mascara). He wears a different wrestling mask to the shrine every day and he never removes his mask. El Vez, the Shrinemaster always arrives at the Shrine dressed sharp in a crisp, clean white linen suit (with pocket square and matching tie). A suit of this nature would appear very wondrous to the many visitors at the Shrine, he says. We tend to agree El Vez! El Vez arrives at the Shrine early every day to begin preparations for the daily stream of visitors to the Elvis Shrine. He is solely responsible for installing all of the cool donated Elvis relics on the Shrine as well as keeping the many hundreds and hundreds of candles lit within the sanctum of the Elvis Shrine. 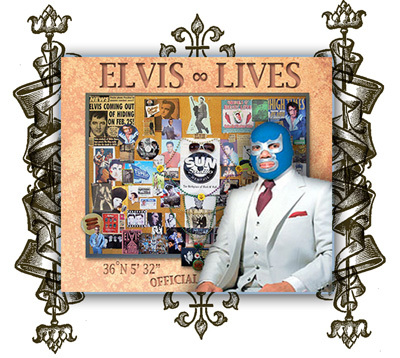 El Luchador himself, El Vez Jones, has declared that he has yet to be unmasked as a reigning ShrineMaster and that he will remain masked for as long as he is worthy of the position of ShrineMaster at the Elvis Shrine or until Elvis returns. Let’s wish Mister El Vez Jones welcome, good luck and a big thank you very much!